Normally usually I put “modern” in the meaning of images that have been taken in the last 10 years (approximately). 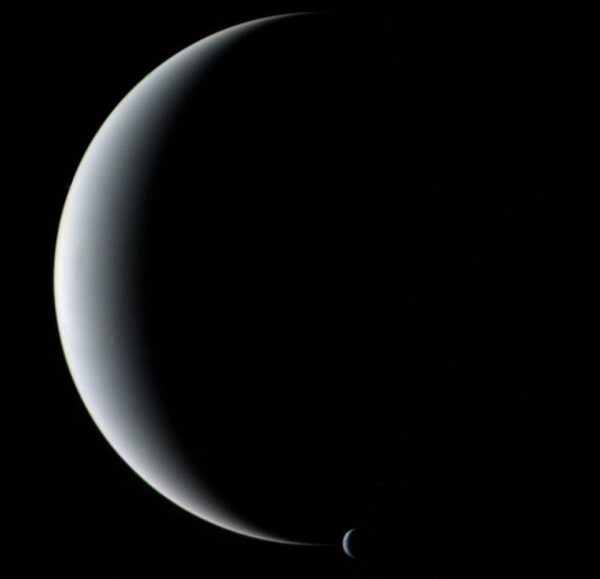 Today I bring you a favorite image of the Voyager 2 Neptune and its moon Triton taken in 1989. Neptune is one of the planets of the Sun most distant solar system and gas composition. About 16 times the size of Earth orbit of 165 Earth years. The gas temperature is around -200 degrees Celsius ammonium compounds, water and methane although above there is a weak atmosphere of hydrogen and helium. Its blue color (hence the name of Neptune) is caused by the absorption of red light by methane. Magnetosphere is due to the movement of gases and liquids that comprise it. Come on, that the friction between water, methane and ammonia is what creates electricity which in turn (and as we know) creates magnetism and therefore its magnetic field. What few, if known, it is that also has rings as Saturn. Milder and frozen carbon, reach about 65 thousand kilometers of Neptune (the Moon is 30 thousand kilometers, to give you an idea). The planet has 14 satellites being Triton (the image) the greatest of all. What is believed is that many of its satellites are only meteorites or debris in the Kuiper belt that have been attracted and captured by the planet’s gravity. That is, meteorite or debris crashing into the belt out of its orbit and that Neptune’s gravity captured forcing them to part. It is also thought that the rings are also made of smaller particles obtained by the same system.